see also First 4 steps! The main aim of the school is to help motivated and talented people to become artists. Prepared, trained, autonomous, sensible, responsible, strong, healthy, balanced, cultured, innovative dance-artists. Nil nocere! = Do not harm! = Ne árts! Do not harm yourself, your partners, your environment! γνώθι σαυτόν! = Gnothi seauton! = Know thyself! = Ismerd meg önmagad! Join in September or January. Come to the next audition to test your motivation, level and find the appropriate group. three times a week, take Contemporary/Modern, Contact/Improvisation and Ballet classes. Pre-Audition Application deadline: 12th April 2019. Invitation to Pre-Audition deadline: 15th April 2019. Pre-Auditon upon invitation: 23-24. April 2019. Final Audition Application deadline: 24th May 2019. Invitation to Final Audition deadline: 27th May 2019. Pre-Auditon upon invitation: 3-4. June 2019. Send your Application earlier and get an invitation earlier! Hungarian MA applicants who wish to get Hungarian State Study Grants must apply through FELVI + submit this query before the 15th February 2019. We have 15(!) state sponsored places for Teachers MA/2019-21 for Hungarian citizens! Live with this extraordinary opportunity! Please prepare to dance barefoot except: ballet shoes at ballet classes, and folk- or sport shoes at the folk class. After the pre-audition everybody will get a personal feed back. BA – 2 years, depending on previous studies, learning strategies, age, speed of personal development + possible Erasmus studies abroad. BA – 36 weeks from the beginning of September to the Middle of June. 1-2 week holidays 4 times a year. One week summer Creative Week. 5 days of the week, optional weekend rehearsals. After successfully fulfilling all of the above, the student gets her/his diploma that will be automatically accepted in the EU and examined and accepted individually everywhere else. BCDA is the short name of Budapest Contemporary Dance Academy. It is a Budapest/Hungary based international school for young people who want to become a professional contemporary dancer or teacher. What shall I learn at BCDA? – how to accept and how to change. Creativity, Dance and movement techniques, Learning strategies, Life strategies, Health care, Dance marketing, Instrumental music, …see details at Study Plan Chapter above. At BCDA the student is responsible for her/his success. BCDA and teachers will give everything to achieve your goals. What can I do with my BCDA diploma? Your knowledge will be accepted everywhere. Your diploma will be valid in the EU. It will be examined everywhere else, and will be accepted almost everywhere else. First of all you will teach yourself. You will learn a lot from your mates too. The founder/director – Dr. Angelus Iván – started to teach dance in 1982. Ballet, Folk and other non directly contemporary disciplines are taught by the best teachers of each style. Where do BCDA actual students come from? Most students have previous training or take a year of intensive preliminary course provided by the school. The proportions are changing, year by year: nowadays students speak 15 different languages. The increasing cultural diversity is becoming an important factor of the cultural impact of the school. What do former BCDA students do after finishing school? Most students become a professional dancer. Dancing and creating, and sometimes teaching comes together in their artistic practice. They often create in their own projects or establish their own companies. Others become members of international or Hungarian companies. Many of them start to teach children or amateurs. Others continue their studies in other international schools or through Erasmus projects. Freelancing internationally with mixed activities is very typical. After having had a professional dance experience they often have an interest in movement related healthcare activities such as yoga, Alexander Technique, massage, … Those who find more distant professions can also transfer the school’s experience to their work and life. See the detailed list of our former students and our alumni site under construction . What is the opinion of guests, teachers, actual and former students? Most partners highlight the personal treatment, the enthusiastic community, the innovative harmony of the continuously changing curriculum, the autonomous, creative orientation of the teaching. Visitors see and appreciate the balance of discipline and liberty. See testaments in a prezi or on youtube videos . How can I become sure that this is my school? Believe nobody else except yourself! See classes upon a personal appointment. Participate in the preparatory course. Take workshops with our teachers. Send video links and ask for feedback from our teachers. Check if you like creating, rehearsing, performing. Check if your body and personality wishes this career. Check if you have talent, health, strength, money, support to learn dance. Try to imagine yourself in the school's atmosphere, style, daily practice. If you can say a sincere yes to all questions, we might agree with you. How can I prepare for the audition and school years? BCDA is a Higher Education Institute. Students come after finishing their secondary school studies. Typically not before 18. Hungarian law allows dance higher education institutions to enroll students who paralelly finish secondary school studies. In exceptional cases the Rector may decide to allow starting studies earlyer than the age of 18. There is no administrative age limit. Age is one of the aspects to decide about during the audition process. If the applicant is able to fulfill all requirements age itself will not exclude nobody. We had and we have succesful students around 30. Is a secondary school final exam indispensable condition of applying? Under the actual law on higher education in Hungary anybody can start BA dance studies over 16 years without a secondary school final exam certificate as well, however that will be a condition of his/her diploma. What happens at a pre-audition? Pre-auditions are like a workshop. Applicants/interested students take classes, improvise, present their own solo dances. After dancing together we answer questions and give a personal feedback to those who ask for. Do I have to pay for a pre-audition workshop, or the final audition? What happens at the final audition? Final audition is also a workshop situation. Applicants dance together, improvise, take dance classes: contemporary, contact, ballet, hungarian folk dance, make compositions, learn set sequences, present solo dances. Applicants talk to the members of the committee about their motivation, background, the 15 topics they have sent. Applicants or committee members may ask for the opinion of the school's physicist if necessary. At the end of the second we give a personal feedback and decide and share the decision: YES or NO, or offer other special solutions. How will my day, my week, my school year, my study years look like? As a consequence of the situation described in the Communique issued in November 2018 next study period will be 2 years. 36 weeks a year + 1 week in the summer, 5 days a week, 6-9 hours a day you will be in and around the school. The program will demand all of your focus and ask you to be fully present with your time and energy. You will work individually, in groups, led by your teachers and by your school mates. What shall I have to realize to get my diploma? Ask for student loans in your own country. Ask for school grants after a successful first semester. Part tuition grants are possible but possibilities are very limited. Ask for grants from your municipality, state, region. Work to find helpers, sponsors, mecenas. You will need them after school too. What other costs shall I have*? * Very Minimal budget in 2018. Rates in December 2018 subject to changes. What is the legal status of BCDA? 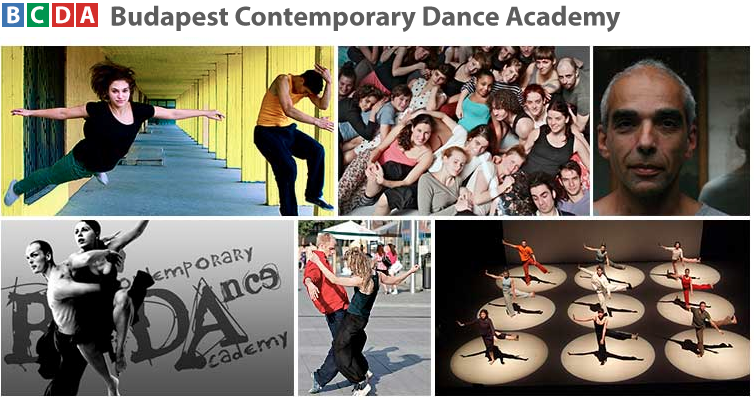 Budapest Contemporary Dance Academy is a state acknowledged Hungarian Higher Education Institution operated under the Hungarian Laws of Higher Education (http://net.jogtar.hu/jr/gen/hjegy_doc.cgi?docid=A1100204.TV) since 2004 . What do we think about our school? Students, teachers, colleagues, partners are more enthusiastic, while teachers and staff are proud but more critical. Read and listen to opinions of guest teachers and students and read the mission statement, self evaluation, and development strategy under construction for the next accreditation process coming soon. Money: Sponsor students, performances, teachers, staff members, special expenses, … Become the school's Maecenas! Spread your opinion about BCDA!